Whalebone is not really bone at all, but is made of keratin a protein material that also makes up skin, hair, hooves and horns. 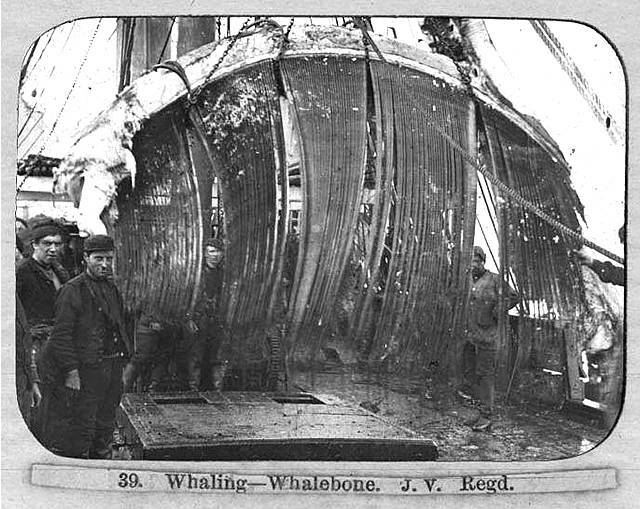 Whalebone is only found in baleen (or whalebone) whales, baleen being another name for whalebone. Here is the front portion of a skull with the baleen plates hanging from it. There are hundreds of individual plates arranged end on the left and right of the whale. The long white curved structure at the top of the picture is part of the whale skull comparable to the skull above your palate. In baleen whales it is greatly elongated and projects forwards with the baleen plates hanging from it like two sides of an approximate triangle. The function of this large extraordinary structure, that these whales have instead of teeth, is to act as a filter for thousands - millions, of tiny planktonic animals that these whales feed on. Different whales have differently sized baleen plates and different spaces between them, this enables them to catch different sizes of food and so the whales can live live together without all competing directly.